Tim Kasher of Cursive is something of a storyteller. 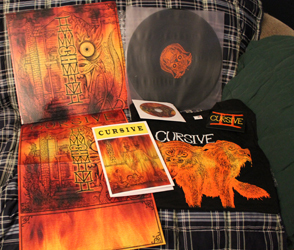 Since Cursive reformed in 1999, they’ve released almost exclusively concept albums, or at the very least, albums centred around some conceptual framework, tethered together by Kasher’s musings on society, religion, relationships, music, and often, himself. 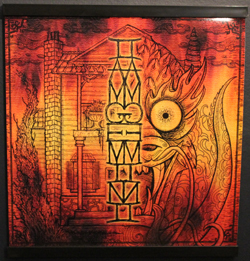 I Am Gemini is perhaps the most ambitious of Kasher’s concept albums: a piece of musical theatre; the story of Cassius and Pollock, twins separated at birth, one good and the other evil, who meet with explosive results. And when I say musical theatre, I mean it: the vinyl comes complete with a script with stage directions. I came on board in 2003 with The Ugly Organ, which is the album I consider to be Cursive’s, and Kasher’s, masterwork. On The Ugly Organ, Kasher is at his most narcissistic, his most self-deprecating, his angriest, his wryest; he is at the top of his game. Since that time, unfortunately, Cursive simply hasn’t been able to catch fire in a bottle the way they did in 2003. Happy Hollow is a strong effort, fully committed to the concept album model, and to be fair, I am a big fan of that album. Mama, I’m Swollen, though, is uneven, and for a guy who is usually lyrically sharp, Kasher never reaches his potential as evidenced on previous efforts, from a lyrical or a songwriting perspective. Coming from Mama, I’m Swollen, I was a little apprehensive for the release of I Am Gemini, but optimistic; I love the two albums previous to Mama, I’m Swollen, and I was hoping that it was simply a misstep, that Kasher et al. recognized as much, and that I Am Gemini would be a return to form. So, is it? Well, yes, for the most part. I Am Gemini is a bit hit and miss, but there is a lot less miss and a lot more hit than on Mama, I’m Swollen. Opening track This House Alive is vintage Cursive, their trademark tense dissonant emo sound (emo by the old guy like me definition, ie. ’90s emo a la Sunny Day Real Estate or Braid or Promise Ring) is in full effect. The band continues in this vein until Lullaby With No Name, which is a wonderful little interlude, but highlights one of my issues with this album: Lullaby is one of the few moments of relative peace or calm (or non-rockingness), and the softer, subtler side of Cursive is something that could have been more fully explored on this album. These parts could have been fully fleshed out: this album has no Bad Sects, no The Recluse. Lullaby has the potential to have been great in full song form. Other than that minor complaint, and a few isolated parts here and there that get under my skin, the album is a big step in the right direction for Cursive. That said, there still feels like there’s something missing if you’re a fan. Kasher never really pushes himself on this album, and the album lacks the dynamic changes of previous works: Cursive rocks out on this album, but they continue to rocking out, rarely letting up to let a song breathe. Perhaps that’s why I Am Gemini lacks the sharp edges of The Ugly Organ. The album itself is a beautiful thing. 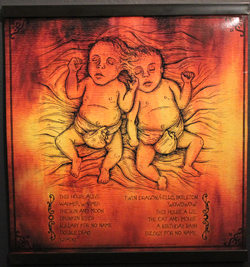 The art is bizarre and interesting, a rusty theme that runs through all of the art for the album, with the twins, joined at the head, depicted on the rear, and the mirror images depicting the personalities of Cassius and Pollock with the stylized title on the front. Inside, the 180 g vinyl is in a plastic sleeve, which I appreciate, and we find the lyric booklet, which is the aforementioned script, a booklet about twice the size of a CD case, very nicely presented. The thing is something to behold. you won’t get that from any freakin’ major label! Yes, I’m looking at you, RIAA, you big evil impersonal bastards! Buy it at Saddle Creek (bundles still available!) or from your favorite vinyl vendor! 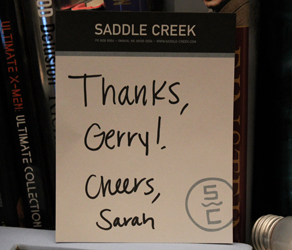 This entry was posted on 2012/02/22 by gryall. It was filed under review and was tagged with cursive, review, saddle creek records. One of my oldest memories is playing with the knobs and buttons on my Dad’s stereo system. It seems like music has always been a key part of my life. I’ve listened, bought, sold, created, collected, and generally obsessed over music for as long as I can remember. This blog is simply an extension of that. I want to have a place where I can rave about my newest likes and purchases, the beautiful vinyls on my shelf, and so on. I have a ton of blogs with similar aims bookmarked; my hope is that folks will find this blog as useful as I find those when it comes time to find new music or nice albums to buy. My goal is simple: when I get something new, I’ll write about it. In between purchases, I’ll write about my back catalogue. Hope you enjoy! Drop me a line if you’d like for me to review something or if you have any suggestions!